We’d love your help. Let us know what’s wrong with this preview of In Search of Certainty by Mark Burgess. Ruling the Machines that Rule the World? Our planet's information systems have now reached a level of scale and complexity at which we can no longer simply decide how they will behave. They are so sophisticated and so interconnected that humans can neither steer nor comprehend them with certainty. Can we trust such an infrastructure to society? For more than twenty years, M Ruling the Machines that Rule the World? For more than twenty years, Mark Burgess has been one of the pioneers of the science and technology behind the operation of this information infrastructure. In this book, he explains how far we have come in our understanding of the systems, and whether we yet have the necessary knowledge to prevent them from spiralling out of control. In Search of Certainty takes the reader on a fascinating journey, from the beginnings of scientific thought to our present day, illuminating information technology as an integral part of our modern historical and cultural narrative. It lays out key challenges for the future and suggests a daring new way to think about the future governance of the vast cybernetic organism we are in process of creating. "An instant classic in computer science! 'In Search of Certainty' is a brilliant piece of work by one of the most brilliant people I've ever met. Complex systems, like modern IT services, need to be understood from a perspective very different from traditional IT practice. The answers are rooted in science and Mark Burgess exposes this science like nobody else." "An incredible journey by one of the [IT] industry's most important thinkers over the past 20 years. Like everything else he's done, this is unique and astonishing in its implications." "Mark brings together the digital microcosm and macrocosm, the mundane and the profound, the human and the technological, in a way that is important, wonderful, and truly mind-stretching." "Mark Burgess practically invented modern IT infrastructure management software. Now he has produced a revolutionary work, part personal journey, part theoretical review, as he advances the state of infrastructure science -- and our comprehension -- again. IN SEARCH OF CERTAINTY is a must-read book from a true visionary." "There are thought leaders, and then there are thought leaders. Mark Burgess is a scientist who can talk to the real world, and has been challenging it for 20 years, with the message of science." "To err is human, to explain is Mark Burgess." "I only got through the Introduction and Chapter 1. I was so encouraged by just those that I started applying it to organization at Joyent and forgot to come back to the book." "A philosophy of informatics obviously contrasting with but also complementing Floridi's philosophy of information." "What I liked most about the book was the vast number of topics it drew on, there are examples from a very broad array of domains. This made it very fun. ... It really is a tour de force of most interesting things that have happened for the past 500 years..."
To ask other readers questions about In Search of Certainty, please sign up. A thought-provoking but often frustrating read. Burgess lays out a conceptual framework for buildilng reliable IT infrastructure using promise theory: a bottom-up approach to constructing systems that can heal themselves in a manner akin to biological organizations. The author offers a lot to think about, the presentation of the book hurts his thesis. The author attempts to weave a narrative that includes many differnt concepts: from Shannon's information theory, Feynman diagrams, cellular automat A thought-provoking but often frustrating read. The author offers a lot to think about, the presentation of the book hurts his thesis. The author attempts to weave a narrative that includes many differnt concepts: from Shannon's information theory, Feynman diagrams, cellular automata, W. Edward Deming, and much more. However, he tells the story at too high a level of abstraction for a reader new to these concepts. In particular, he relies too much on analogies and not enough on specific IT-based examples. Burgess wrote the venerable CFEngine configuration management system that employs these concepts, and perhaps CFEngine users would have an easier time understanding how these concepts apply on the ground, but as someone new to these concepts, I often struggled to see how they would apply in practice. The high level nature of the writing also made the book into a slog. I had to force myself to push through to to get to the end of it. Fascinating book with a lot of important and interesting points. Not great on the readability front. If you are working on/with a complex distributed system, this has some good ideas that are worth wrestling with. Recommended. This is an excellent, if somewhat longwinded, read on scientifically approaching the topic of technology infrastructure and interaction as of today. It discusses an impressive spectrum of topics across physics, information technology, computer science, formal logic, showing a deep insight of the current shortcomings and challenges we're facing. He doesn't get too deeply technical throughout the book, it's mostly a storytelling approach to discover a path that the author had followed throughout his This is an excellent, if somewhat longwinded, read on scientifically approaching the topic of technology infrastructure and interaction as of today. He doesn't get too deeply technical throughout the book, it's mostly a storytelling approach to discover a path that the author had followed throughout his research history. During this journey he points out discoveries and pitfalls on current research, and outlines his own approach to modelling complex dynamical and semantic systems with a theoretical framework of his own, i.e. Theory of Promises. At times I felt overwhelmed by the number of references to scientific notions and research results. I also often felt puzzled while trying to follow the author's reasoning when some of the concepts were introduced and discussed with what I felt was a lack of explanatory examples. I may be possibly missing the necessary background knowledge to completely understand the connections. It maybe that a single read is not enough to actually absorb all the content presented in the book. I would suggest other books from the author if you want to get detailed explanation of the theory exposed, in particular Thinking in Promises. Overall I heartily recommend this book to everyone interested in modern software systems and their growing impact on our lives. 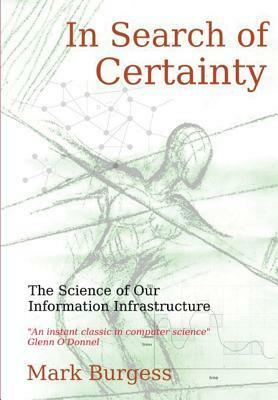 This is an insightful book that will make you rethink how we manage infrastructure and changes. Burgess covers a lot of background before proposing his approach. While many of the topics (history of science, quantum physics, information theory, etc) will be familiar to those reading this, it was a nice summary of current thinking. He then bring all these threads together well in the last third of the book. I would summarize Burgess' approach as DevOps + Antifragile. The book's theme of creating st This is an insightful book that will make you rethink how we manage infrastructure and changes. I would summarize Burgess' approach as DevOps + Antifragile. The book's theme of creating stability at higher layers by embracing instability at lower levels screamed "ANTIFRAGILE" to me at every turn. Oddly enough, though, Taleb is not cited and the author seems unaware of the linkage. One warning for anyone reading this book: the typography is terrible! To Burgess' credit, his Web page cites that he struggles with typographical errors. Even so, if anyone edited this book, it does not show. I didn't mind the grammar and spelling issues (as a somewhat reformed grammar nazi), yet the number of repeated words, left out words, and sentences that just made no sense made me want to throw this book against the wall about a dozen times. Thought provoking (my copy is now full of post-it flags from all the interesting passages I wanted to come back to), but ultimately Mark Burgess was trying to do too much in this book. He spent a ton of time trying to hang together physics metaphors for large scale computing systems as a way to make the case for Promise Theory, the modeling approach he has been developing. As a former physics guy myself, I appreciate where he's coming from and I fall back on some of the same tools (phase transit Thought provoking (my copy is now full of post-it flags from all the interesting passages I wanted to come back to), but ultimately Mark Burgess was trying to do too much in this book. He spent a ton of time trying to hang together physics metaphors for large scale computing systems as a way to make the case for Promise Theory, the modeling approach he has been developing. As a former physics guy myself, I appreciate where he's coming from and I fall back on some of the same tools (phase transitions, equilibrium states) when I think about infrastructure, but I'm not convinced that's useful beyond just being a personal habit of mind. There were lots of citations to academic papers in here - perhaps some of those make explicit how promise theory modeling is actually isomorphic to physical structures. The least technical book of Mark, and therefore more easy to read. Still a lot of connections to other fields than IT like physics, building to a statement that System administration is still at the beginning of a revolution. I found the first two parts to be more interesting than the third. Overall is was a decent book, but it lag in the end. There was also a severe editing problem. I found so many mistakes in grammar, it became quite tedious at times. Just who I wonder is responsible for.this. Mark Burgess is a writer with many interests. His books span from fiction to hard science, and he actively writes philosphically in his blog about all aspects of modern information culture. He is an active public speaker on the international conference circuit, and is engaged in promoting science to a wide audience. He is the Founder and original author of CFEngine. He was senior lecturer and then Mark Burgess is a writer with many interests. His books span from fiction to hard science, and he actively writes philosphically in his blog about all aspects of modern information culture. He is an active public speaker on the international conference circuit, and is engaged in promoting science to a wide audience.